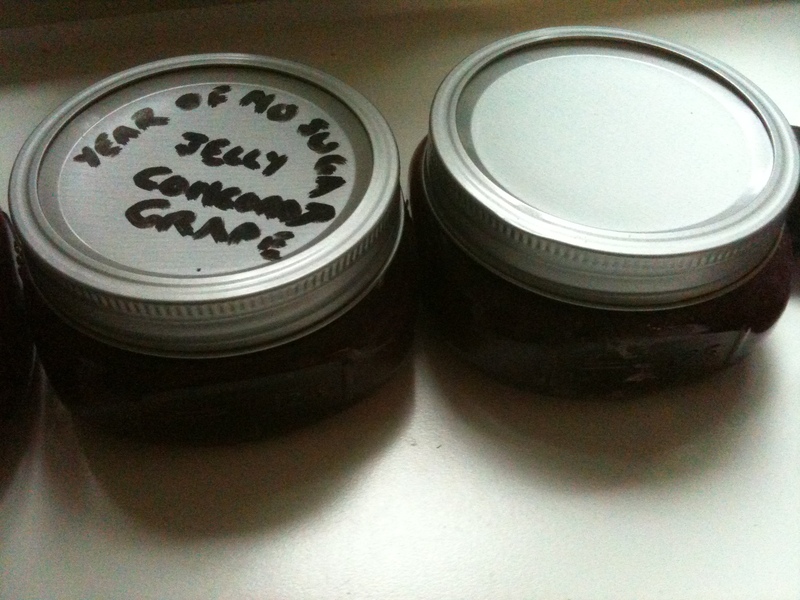 Among my many experiments this year I tried making a No-Sugar Grape Jelly. I had my work cut out for me: if you’ve never made jelly or jam then you might be astounded to know exactly how much sugar actually goes in the average batch. It’s not uncommon at all for a batch of, say, blueberry jam to call for seven cups of sugar. Yes. Seven. This works out roughly to a cup of sugar per pint jar. Think of that the next time you have toast. 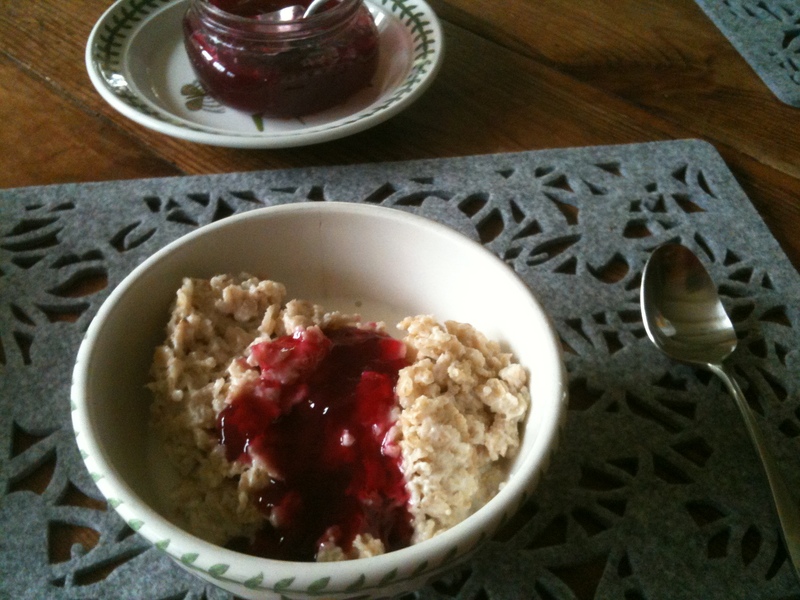 Like baking, jam isn’t improvisable. Unlike making a stew or omelette where you can just throw in what you’ve got and get something edible at the end, jam is really a science. In order to get jam or jelly to “set up” correctly, ie: get that gelatinous, not-liquid-not-solid consistency, you have to have an appropriate amount of pectin, which naturally occurs in fruit, and more so in unripe fruit. In the olden days jam must’ve truly been an art form, figuring out what percentage of ripe to unripe fruit to use, testing with a cold spoon to see if after cooking the jam had “set” properly, before beginning the long, hot procedure of “processing” your sterile jars filled with jam to make them seal correctly for storage. These days, most jelly and jam makers add powdered pectin to the cooking fruit, which ensures that your jam will set up like a golden retriever every time. In recent years, I’ve made many batches of delicious jam in just this way. So I wondered: what if I made a jelly that followed all the instructions, but substituted dextrose for sugar? Would it work? This was going to be a lonely journey, however. If you a modern canner, then you know that the literature available about canning today is not for the faint of heart. “WHATEVER YOU DO” they all read in the most alarming font they could find, “DO NOT, REPEAT DO NOT TAMPER WITH THESE RECIPES IN ANY WAY OR YOU AND EVERYONE YOU’VE EVER LOVED WILL MOST ASSUREDLY DIE FROM SOME TERRIBLE FLESH-EATING BACTERIA!!! !” I have at least four books with canning recipes and they all say virtually the same thing: no improvisation allowed. NONE. Story’s over, go to bed. Meanwhile, if you talk to the old-timers, the ones who canned decades ago with things like rubber seals and wax, you get an entirely different story. They all say the same thing: “Oh, it’s fine. Don’t worry. Jam is incredibly hard to spoil! And even if it does mold on the top a bit, you just scrape that bit off and eat it anyway.” !!!! Now, I probably wouldn’t go so far as to eat mold-encrusted jam, but wasn’t there a happy medium we could arrive at here? Was a homemade “no sugar” jam possible? At the end of September the concord grape vines in my backyard were sagging with fruit and I decided I would try my experiment on these. This adds an extra step- I usually prefer jam with nice big chunks of fruit and skin throughout, but Concord grapes have to be made into jelly, not jam, because of the seeds and tough skins which must be removed. 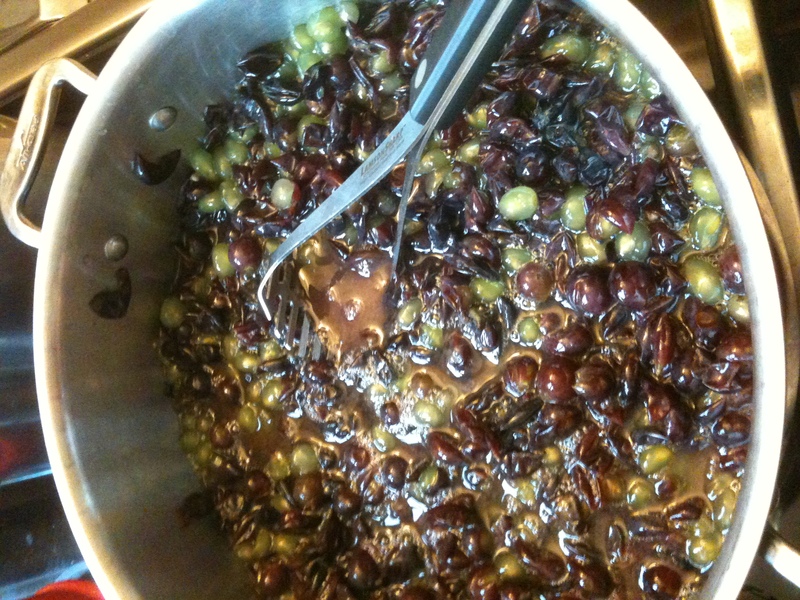 After cooking and straining the grapes through cheesecloth, I began to boil the sweet juice. Now right here I realized I already had a problem. Juice? I stopped right in the middle of my steaming, juice-slopped kitchen, with the sudden realization. We haven’t had juice since January 1, even as a sweetener, where it crops up often at the health food store. 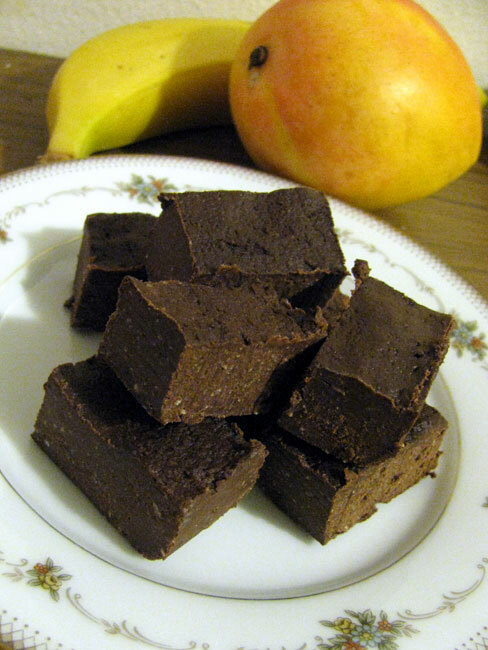 The family rule is: fruit must have corresponding fiber attached. Period. Huh. Why hadn’t I thought of this before? What should I do? Well, I was dying to know if my experiment would work, and, I rationalized, if it did, it could be extrapolated to jams which would include the skins and pulp. But today grapes were what I had to work with. Onward. At this part of the procedure, with the boiling fruit in one pot and empty glass jars sterilizing surgically in another, I always feel like I’m engaged in some wonderful alchemical process that will transform some delicious but humble fruit into pure edible magic. They’re so beautiful, jars of jam in translucent hues sitting glinting on our shelves, waiting to remind us in the depths of a Vermont winter what the tastes of summer were. In the case of our concord grapes it’s even better because they’re free: the things grow like weeds in our backyard, no matter how badly we treat them, but due to the seeds and skins they aren’t much of a tasty snack. Without the jelly, this wonderful taste would pretty much go to waste, enjoyed by our backyard birds alone. So I followed the recipe. After boiling the intense, incredibly purple juice for ten minutes I added ¼ cup of dextrose (instead of the called-for sugar) to a bowl containing the pectin powder and stirred this into the pot. (This is an extra step which you do with what I buy, which is “Low-Sugar Pectin”: it enables you to use less sugar in your jam, say five cups of sugar instead of seven. Seriously.) Brought to a boil, I then added the rest of the dextrose- 3 ½ more cups. Boiled exactly one minute, and then removed from heat and I began ladling into sterilized jars. Actually, I cooked it a little longer than one minute, trying to ascertain whether the set-up would really occur using the dextrose. It looked right- gelatinous and jelly-ish. 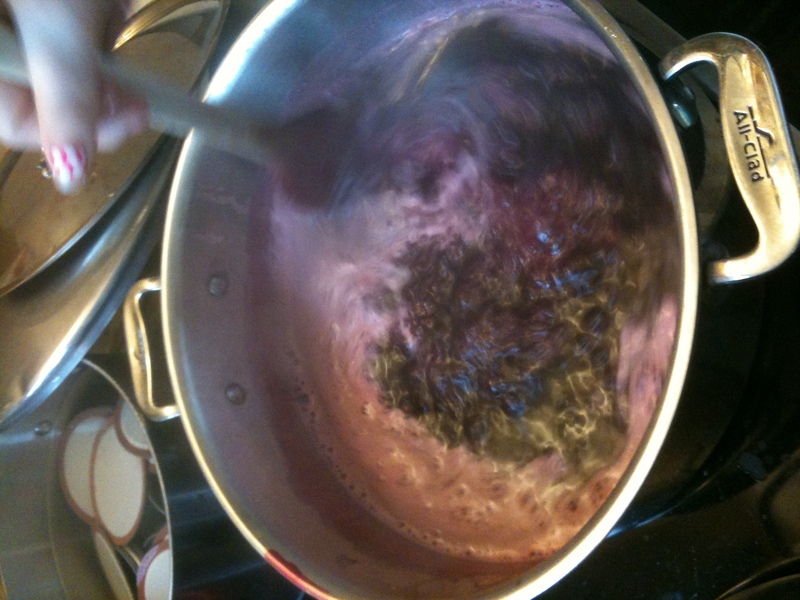 But I’d always relied on pectin to do this part for me… The boiling purple lava was ladled into the jars, hot lids screwed on “finger-tip tight” and into the bigger pot they went for the final sterilization. The filled jars boiled underwater for the requisite five minutes before being pulled out with jar tongs to cool on a dishtowel. My research continued. I was determined to figure out what went wrong- and I began to learn a lot of disturbing things. For one, guess what store-bought low-sugar pectin has in it? Now, if you can’t guess by now I’m going to be very disappointed. Yes! SUGAR. That’s right: the low-sugar pectin- “for use with less sugar!” has sugar in it. How ironic. How totally predictable. Turns out, there is a pectin that you can order or find at the health food store that contains NO sugar, called Pomona’s Universal Pectin. (Instead of being activated by sugar, it is instead activated by calcium.) Even Pomona’s, however, doesn’t list recipes omitting sugar- sugar, honey, artificial sweetener and juice concentrate are all listed, but no sign of the No Added Sugar recipe I’ve been searching for. Silly me, this meant I was adding pectin to my grapes, without the required mountain-load of sugar present to activate it. Did putting it my jelly do virtually nothing? Or would dextrose do the same but just require different amounts? Also, tragically, my grape “sauce” would likely have a shorter shelf-life than the average estimate of a year for canned items. I could live with that. Wow. You’d think they’d cover all this in Canning and Preserving for Dummies, right? But they don’t. Just shut up and follow the recipe, people. And anyway, what kind of crazy person would ever want to make grape jelly without sugar? Hi! Loved this, because I was conducting a parallel experiment in my kitchen with Pomona’s and little sugar–probably at the same time! I, too, have a lovely selection of Concord grape sauce (lovely in smoothies). We should set up a WP laboratory next jam/jelly-making season and concord those grapes together! You know it’s funny, I was actually just reading something the other day about pectin, and I came to realise that it’s actually a polysaccharide! I had no idea. Can you get store-bought sugar-free jams in America? In Japan they only have blueberry and strawberry, but in Australia there’s quite a range of flavours. Dear Eve, I am a partner in Pomona’s Pectin and I thought you might like to know that Yes, you can make jam or jelly with Pomona’s using no sugar or any type of sweetener at all. You would follow the directions on the Pomona’s recipe sheet that comes with pectin for “Cooked Jam or Jelly using artificial sweetener that DOES NOT measure like sugar,” which means adding the pectin to boiling water and blending until the pectin is dissolved. Then you can just add the pectin-water to your fruit. Good luck with your Year of No Sugar. Wow! Thank you for your comment Mary Lou- I am very very excited to hear this and looking forward to trying it- thanks again. You are currently reading A Year Of No Sugar: Post 81 at Eve O. Schaub.